– Dangerous in a kitchen. And not in a good way. TSoW at least five times, most recently July 6, 2014. – Editor of Dr. Steel’s Wikipedia page (http://en.wikipedia.org/wiki/D…..ctor_Steel), Wikiquotes page (http://en.wikiquotes.org/wiki/D…..ctor_Steel), and TvTropes page (http://tvtropes.org/pmwiki/pmw…..octorSteel). — Co-Executive Officer, Division 1123, the Fibonacci Division. As a fellow musician and artist, I like some of the good Doctor’s music… but I am more intrigued by his artistry, his use of instruments, his theatrics and showmanship, his humor and his philosophy (I’m not a victim, I’m in control, I decide, I can do anything I believe I can do and put the effort into doing…). He is obviously a man of extraordinary intelligence, wit, talent and charisma. And I like his eccentricity, another trait we share. I’m an older recruit, but I’m told I look (and I feel and think like I’m) 10-15 years younger than I am, and I am a big kid at heart (which probably explains why most of my friends are in their 20s). I have Aspergers’ Syndrome and so struggle daily to be “normal”… but every now and then I need an outlet to let my inner geek out for some playtime, and this seems like a good place for that. Oh yes, and I am a sharp – albeit eccentric – dresser. (Usually dressing in a 40’s style.) And I love hats. Particularly fedoras. I look damn good in a hat and long coat. Formerly “General ßatmÅn” on Showtime’s old Stargate SG-1 fansite, Commanding Officer of SG-11’s Men in Black unit. “When I became a man I put away childish things, including the fear of childishness and the desire to be very grown up.” -C.S. Lewis. – “Raising Daisys” fundraising mission – Success! – Blue Doo Dah (Parade invasion 2013) – Success! – Doo Dah Museum Exhibit – Success! – Doo Dah Drei (Parade invasion 2012) – Success! – Dr. Steel Tribute Film: Complete. — Reconstruction of the film: In progress. – Disneyland Invasion VI (2012): Couldn’t go, alas. – Giant Robot Construction – On hold. 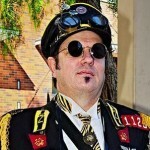 – Pyrate Daze Invasion 2011: Major success! – Global Invasion – Surf’s Up 2011: Unfortunate failure, but we had fun anyway. – Operation Chronic Tacos – SUCCESS! – Doo Dah Deux: Completed, FUN! – Operation Poppy: Completed, FUN! – Global Invasion: Operation Hayseed II: Revenge of the Hicks – WE GOT KICKED OUT! – Doo Dah Parade invasion 2010 – EPIC SUCCESS!!! – Operation Get Shorty – Failed. (Those bastards!) But with some success as we flexed our power and had fun. – Operation Wikipedia Redemption – COMPLETED – SUCCESS! Current on-going goodwill campaign and protection of his and other steampunk pages from vandalism. – Operation Mr. Twitter – SUCCESS! – Global Invasion: Operation Surf’s Up! – COMPLETED: Awesome success! – Operation Steel Samurai (Dr. Steel-themed samurai uniform) – COMPLETED – Success! Everyone wanted photos of my Steelified samurai costume; I must have been in over 60 photos, and I even got on TV! – Operation FOSSL – COMPLETED – SUCCESS! – Operation: 1,000,000 Plays – COMPLETED – SUCCESS! – Mission: Fark ‘shopaganda (inserting Dr. Steel references into Fark photoshop contests) – ongoing. Always looking for stealthy ways to insert Doctor Steel into my posts and submissions there.